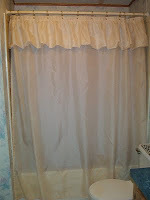 Well, it's done, not bad for my first time making a shower curtain. I love the fabric and the colors in it. The one below was the old one that has been there since the kids were little, so it's more than time for a new one. Not sure what I'm doing today, I've got a bunch of fabric to cut out for a Table runner and I have to cut out a couble more blocks for the squishie swap so I guess I will be cutting today lol. 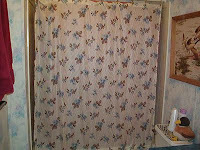 I love your new shower curtain...It is just so pretty!